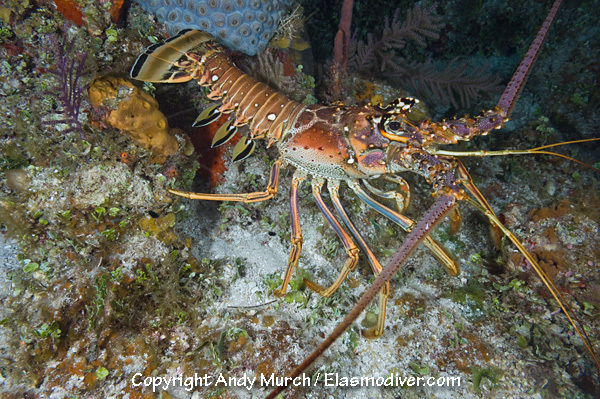 COMMON NAMES: Caribbean spiny lobster, spiny lobster. DESCRIPTION: The Caribbean spiny lobster has a predominantly reddish brown to tan carapace. Its abdomen has one pair of parallel small white spots on each segment. Its legs are lined with blue, purple and black. RANGE: Caribbean Sea and tropical western Atlantic. All of the lobster images on elasmodiver.com are copyright protected. No unauthorized use of these Caribbean Spiny Lobster pictures is permitted. Please contact Elasmodiver for further information.